Amyotrophic lateral sclerosis — ALS — can arise from aberrant genes. A group of five Brown University professors proposes that a cure may also come from aberrant genes — genetic mutations that suppress ALS. A new research grant supports their comprehensive investigation of ALS in flies, worms, mice and human cells. PROVIDENCE, R.I. [Brown University] — Six years ago none of the five Brown University researchers with a major new grant from the ALS Finding a Cure Foundation had even worked on amyotrophic lateral sclerosis. That’s exactly why the team has a unique approach for making much-needed progress against the untreatable neurodegenerative disease. Their strategy is no one’s idea of the natural next step in conventional ALS research. What makes their effort worth a shot is that the team brings together the diverse scientific brain trust needed to try something quite different. In decades of work in neuroscience and molecular biology, they have developed the needed expertise by working on other things. 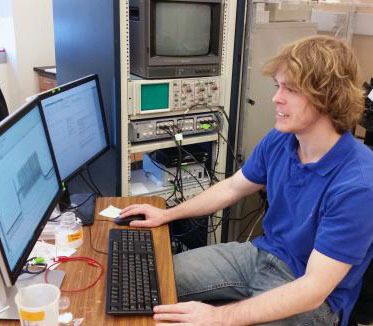 “We came to this independently,” said team member Justin Fallon, professor of neuroscience. So what’s the big idea? In a nutshell, they hope to uncover therapeutically actionable intelligence in the battle against ALS by finding rare, random cases in which genetics also derail the disease. Some genetic mutations harm us — there are about 50 mutations associated with ALS — but some mutations can help. The premise of the research — and the team’s initial results directly support this — is that there are “suppressor mutations” that end up protecting motor neurons from dying and muscle from falling apart even when an organism has a gene for ALS. The team screens for these suppressor mutations by engineering key human ALS genes into fruit flies and C. elegans worms. Then they breed them by the million. Those few that manage to thrive despite their purposely tainted lineage are the ones lucky enough to have acquired potential suppressor mutations. Working with two colleagues from Massachusetts, the team will pit the suppressor mutations that work in both the fly and the worm against ALS genes not only in the mouse, but also in human stem cells that have been turned into motor neurons. If all goes wonderfully well, within a few years, they’ll see human motor neurons with ALS genes resisting the disease because they’ll also have a suppressor mutation found by the team. It’s a completely unbiased approach, Lipscombe adds. Rather than trying to guess what mutations might counteract ALS, they are letting the randomness of mutation show them. They’ll build on whatever results show promise. The bright blue on the left indicates a healthy nerve joined with red muscle. On the right, in an ALS fly, the nerve is less robust and the muscle is fraying. Along the way, in all those diverse models, the team expects to make many key findings about the molecular mechanisms by which ALS kills motor neurons and weakens muscle and by which suppressor mutations prevent that damage. 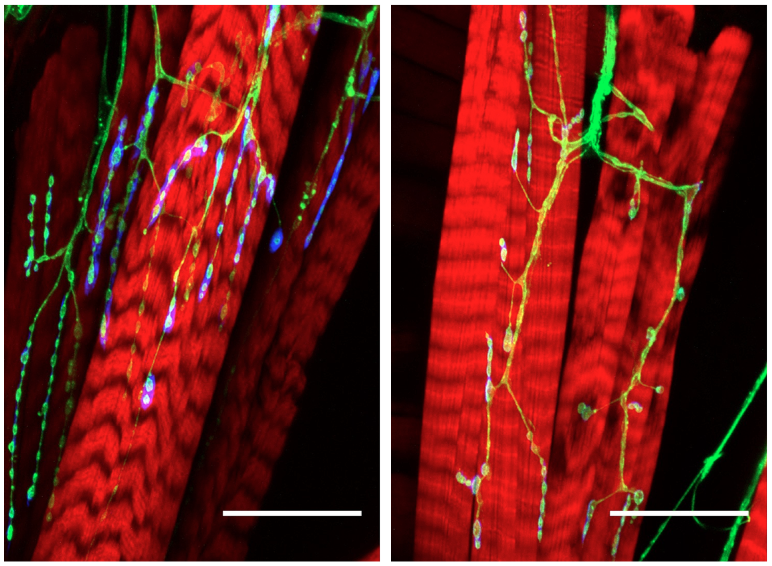 They’ll probe the electrical and physiological properties of motor neurons and their junctions with muscle. They’ll track the progression of the disease in behaving flies, worms, and mice and look for the earliest possible signs of disease. That knowledge about how ALS and suppressor mutations work could lead to a therapy. Nine in 10 ALS cases have no clear genetic cause, Fallon said. It seems likely, though hardly certain, that whenever the disease arises, it will share the same downstream flaws in gene expression, protein-making, or cell function. The scientists believe that as they gain an understanding of those pathways of biological action common to their diverse models of the disease, and as they see how suppressor mutations counteract those, they’ll gain a clearer sense of how to intervene. “The hope is to identify pathways that one can then target drugs to,” said Kristi Wharton, professor of biology. Robert Reenan, professor of biology, got it started in 2010. With a genetic engineering technique called homologous recombination he could insert a mutation known to cause ALS in the homologous human gene exactly where it should be in a fly’s genome to make the fly a disease model. He inserted such mutations in the first known ALS gene, SOD1, and created the most accurate fly model of ALS to date. Some of Reenan’s inspiration came from Brown’s ongoing exchange with Boğaziçi University in Turkey, supported by the Suna and Inan Kiraç Foundation. The Istanbul university has a strong program in neurodegenerative disease and doctoral students sometimes come to Brown. When Reenan presented success making an epilepsy model in flies, colleagues at a meeting there encouraged him to try ALS. After Reenan’s success, Anne Hart, professor of neuroscience, who uses C. elegans worms to study the incurable neurodegenerative disease spinal muscular atrophy, was inspired by Reenan to create a comparable ALS model in worms. It worked, demonstrating that some of the genes plaguing humans were universal enough to trouble worms and flies, too. “We could then combine efforts,” Hart said. Reenan and Wharton, who studies molecular pathways controlling development using the Drosophila fly, teamed up to screen a specific set of fly mutations for suppressors with support from the pharmaceutical company Biogen. Reenan and Hart also received funding from the ALS Association, and Wharton and Hart from the Judith and Jean Pape Adams Foundation. About two years ago, Hart, recognizing this building momentum, began convening regular meetings of ALS-interested labs such as those of Reenan, Wharton, and Fallon, who uses mouse models to study the tragic breakdown at the nerve and muscle junction in Duchenne muscular dystrophy. He too had begun to investigate ALS. In a BIBS conference room, graduate students and postdoctoral researchers would present their latest work, bringing the whole group closer together. Soon they recognized the potential of expanding the suppressor-mutation screening strategy to mice, and they invited Lipscombe, an expert in neuron electrophysiology in mouse models, to join the group. They also began to collaborate with ALS expert Dr. Robert Brown of the University of Massachusetts Medical School, who discovered the first ALS mutations in SOD1 in 1993. He began to provide ALS models of mice. With these additions, they had formed a team of six labs that could study the genetics, molecular biology, electrophysiology, and disease progression of ALS — and ALS as thwarted by suppressor mutations — across widely varying animal models. ALS is also known as Lou Gehrig's disease. A 2015 award from the ALS-RI chapter recognizing seven Brown researchers hangs in Sidney Frank Hall. 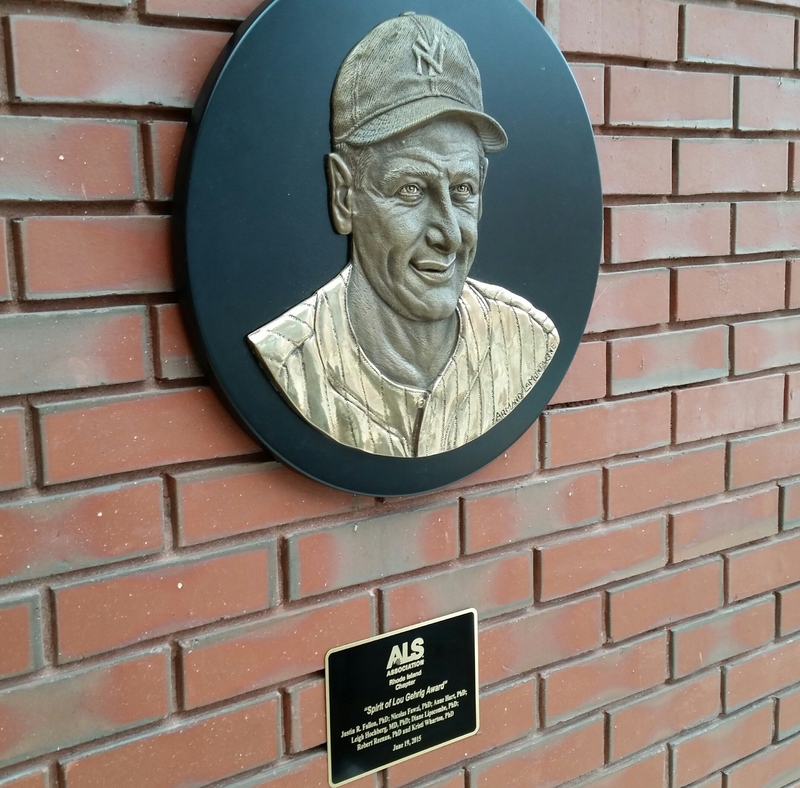 The progress gained an important recognition last summer when ALS Association’s Rhode Island Chapter recognized the team with its Spirit of Lou Gehrig Award. The honor also included two Brown researchers who do other research involving the disease: Nicolas Fawzi, who studies the structural biology of proteins associated with ALS, and Dr. Leigh Hochberg, who directs the BrainGate2 pilot clinical trial, in which patients with ALS or other forms of severe paralysis can use an investigational brain-computer interface to regain some independence. In 2015, the team presented its multispecies suppressor mutation strategy to the ALS Finding a Cure Foundation. The foundation liked the idea and introduced the team to Dr. Brian Wainger of Massachusetts General Hospital, to integrate his work on ALS in human stem cells turned into motor neurons. The package was complete. Flies and worms give them the numbers to produce and spot rare suppressor mutations. Mice give them a mammal model in which to track disease progression from gene expression to behavior. Human cells give them a first look at whether it could matter clinically. “Each model system has its strengths and its weaknesses,” Hart said. The new grant began in the fall of 2015 with an award of $1.8 million. As the team demonstrates progress, the grant could continue for up to another two years and a total of $4 million. Reenan reports a promising start. During the summer of 2014 a Kiraç-funded graduate student in his lab, Asli Sahin, led a team of nine undergraduates in screening flies for suppressor mutations. Reenan can’t say too much in advance of peer-reviewed publication, but subsequent analysis appears to show at least one suppressor mutation that protects flies against multiple ALS genes. If that result holds up to further analysis, the rest of the plan kicks in. The group will cross-check its performance in the worms, then the mice, then the human cells. Along the way, they’ll study the differences in gene expression, molecular pathways, electrophysiology, and whole-animal behavior and progression in their ALS models, with and without the suppressor gene. It’s a huge effort that over its course so far has involved dozens of professors, postdoctoral researchers, graduate and undergraduate students. But the chance to make progress against the tragedy of ALS, which affects thousands of people in the United States alone, and to learn new biology is energizing, the team members say. For now, they are contributing a new strategy. But if that pans out, they’ll have contributed a whole new way, as their benefactor asks, to find a cure.